One of my rules or guidelines for Flashback Friday was, no compromising photos. I would catch total hell from my family if I splashed some terrible photo of someone across the internet. Funny, but as I’ve been going through all these photos, the only so called “bad” ones, are of me! SO….here it is, one of yours truly, at age 10, being a total goof-ball, with a few tennis balls. Don’t you just love the hair and glasses?? Stylin’!! 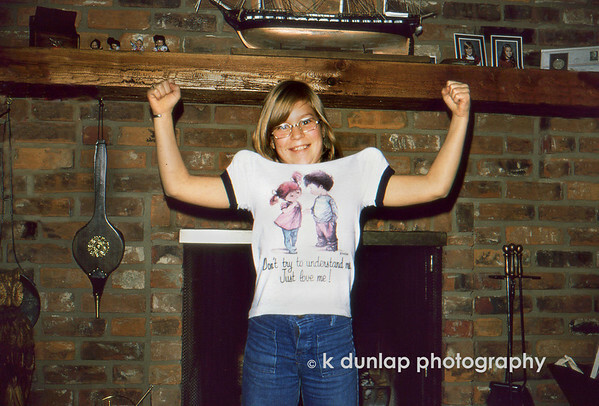 I love the saying on my shirt, “Don’t try to understand me, just love me.” That is so true. I love it! Too funny. When I looked at this photo I thought it was taken at my house where I grew up, we had the exact same fireplace! Freaky.